In this tutorial we will what are ways to change the SAP standard system.SAP out of box system may not meet the business requirements we need to change the SAP Standard system, to do we have different ways of it. Let us look at each of them. 1. 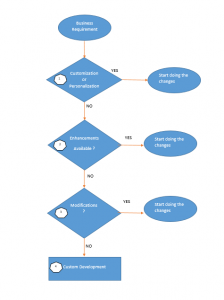 Customizing: This option is available to configure the system according to the clients business requirements/process.This activity is performed using tcode SPRO → IMG and it is done SAP Functional consultants for each modules in SAP like MM, SD, FI, CO etc..
2. Personalization: Defaulting the values to certain fields on screens, hiding screens/fields in a transaction code comes under Personalization.For example creating Transaction Variants or Screen Variants using tcode SHD0. 3. Modifications: Modifying SAP standard objects which are provided by SAP to meet business requirements.If SAP releases a new version of changed SAP Object while upgrading the system we need to make sure that our changes are again added and this can be done by Modification Assistant. We need to get access key from SAP Service market place to modify any object.For example User Exits in SAP ABAP, VOFM routines in SAP SD module comes under this category.This activity is done by SAP Technical Consultants. 4. 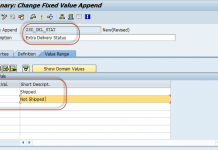 Enhancements: Enhancing the SAP standard objects without modifying the SAP standard object.Some places in SAP standard objects are available for customers to add new code to meet business requirements. 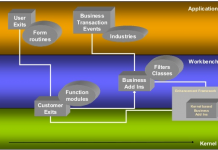 Customer Exits, BADI’s, Business Transaction Events(BTE), Table Enhancements(Table and Data Elements) comes under this category.This activity is done by SAP Technical Consultants. 5. Custom Developments: Developing new custom objects which are specific to the customers to meet business requirements.This activity is done by SAP Technical Consultants. 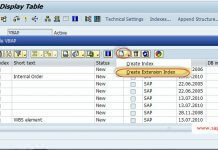 You can follow the below order when ever you want to change the SAP standard objects.